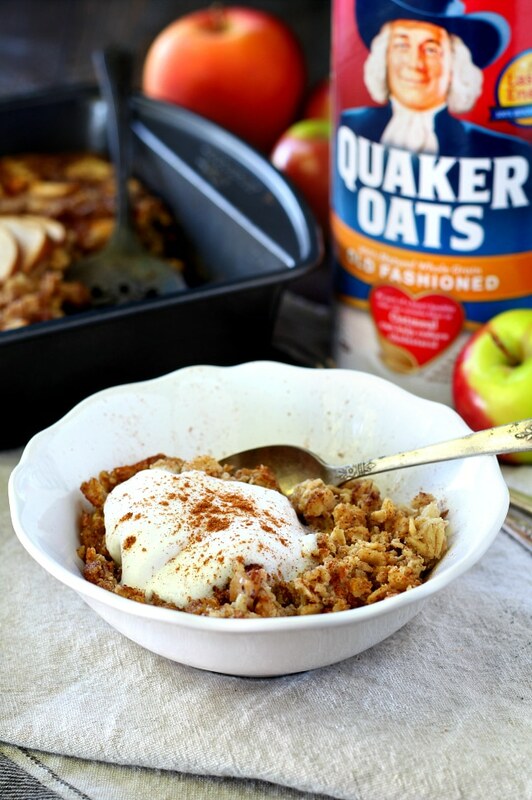 This Healthy Apple Cinnamon Baked Oatmeal and this post were sponsored by The Quaker Oats Company as part of an Influencer Activation for Influence Central and all opinions expressed in my post are my own. 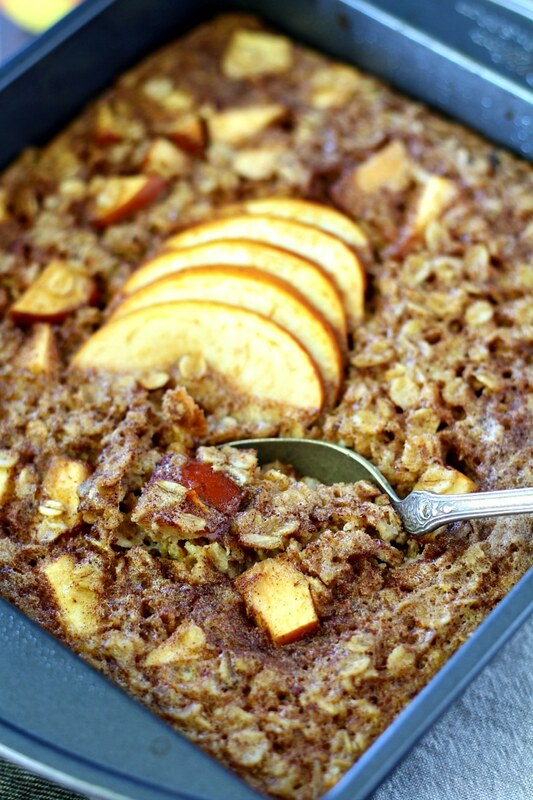 The perfect warm breakfast for cool crisp mornings is this Healthy Apple Cinnamon Baked Oatmeal. Along with Quaker, I’m celebrating everything oats for Oatober and I can’t think of a more scrumptious, cozy and best of all- so very easy way to enjoy my favorite grain! Sometimes I get in breakfast ruts and make the same smoothie or pancakes over and over again. 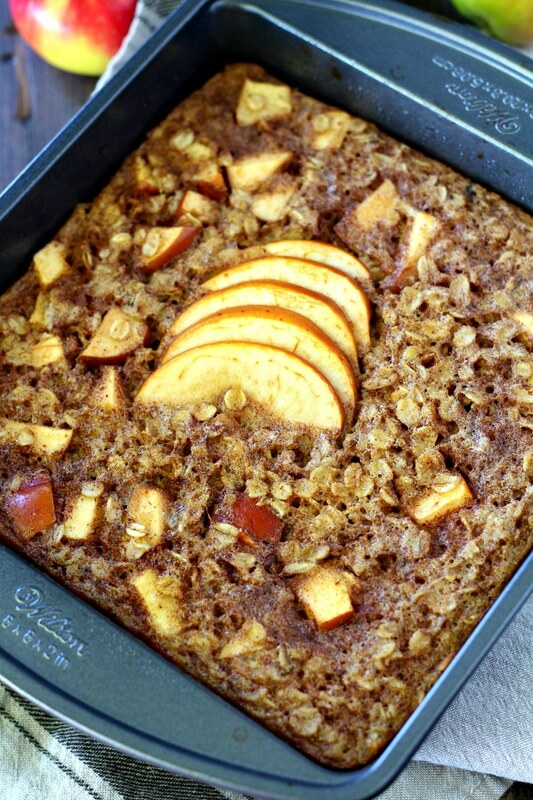 These last few weeks it’s been this healthy apple cinnamon baked oatmeal. Remind me again why ruts are a bad thing? 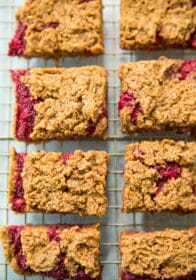 Baked oatmeal is such a satisfying, nutritious meal and makes for a super convenient make-ahead breakfast. I bake it up on Sunday and we have plenty of oatmeal for 6 morning meals throughout the week. It’s teenager-friendly, too – Landen LOVES this apple version. 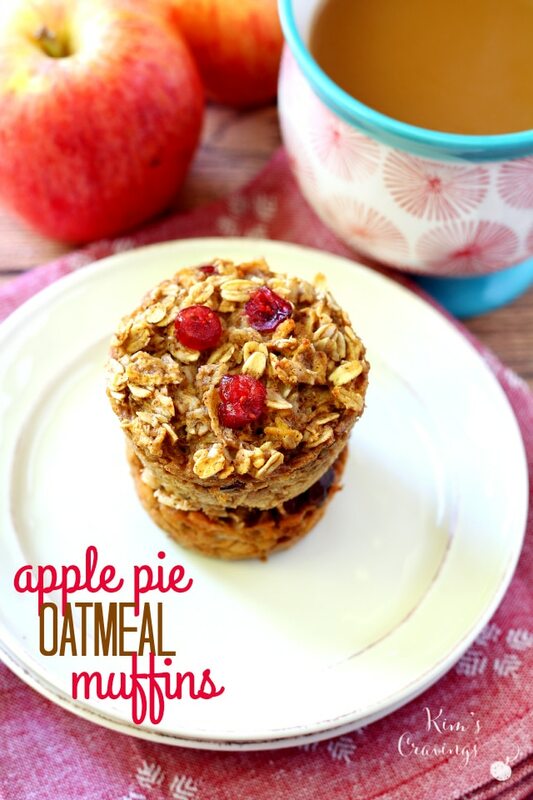 It’s loaded with healthy ingredients— Quaker Oats, applesauce and apples. A couple of eggs bind it all together, and a light drizzle of coconut oil makes it taste like a treat. Savory or sweet, Quaker Oats are my go-to breakfast. Quaker has been going strong for almost 140 years, so you can rest assured you’re getting the highest quality of oats possible! From pumpkin pie oatmeal to pumpkin oat waffles, I’m celebrating this super grain in a major way this month. Let’s just call it Oatober! Speaking of pumpkin, it’s been getting all the love, lately, but I’m so smitten with apples and honestly, if I had to choose, apple cinnamon would take the prize as best fall flavor. And apples and oatmeal go together like peanut butter and jelly, so I knew it was about time I make an apple cinnamon baked oatmeal. 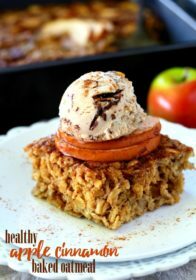 My healthy almond joy baked oatmeal is such a great oatmeal recipe, I used it as a guide for this baked oatmeal. I love, love, love the way this oatmeal turned out. 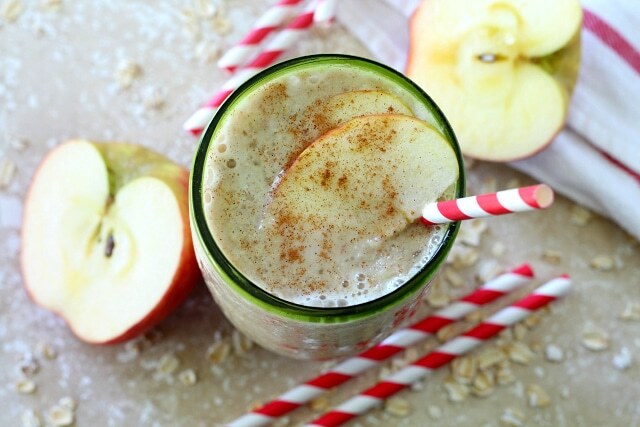 It’s thick, creamy, warm and full of apple-cinnamon flavor. It’s so flavorful, there is really no need for a topping, but for fun I tried a scoop of dairy-free ice cream. Ummm… yea, so it was pretty much amazing. 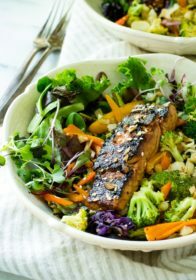 Just one serving is so satisfying and always keeps me full ’til lunch with plenty of fiber and protein. 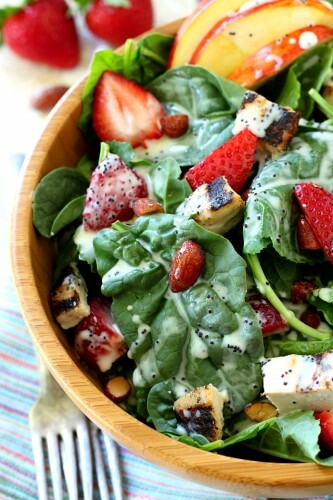 You could even add a dollop of almond butter or other nut butter for extra protein, if you wish. I enjoy my oatmeal on weekday mornings since it’s become part of my daily routine. 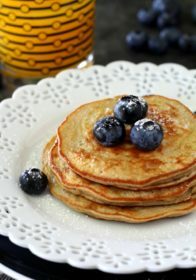 This would also make a dreamy weekend breakfast, or even one you could make ahead of time and reheat throughout the week for a quicker meal option (like me)! It’s especially ideal throughout the holiday season, particularly when hosting guests – it’s the ultimate warming, comfort food. 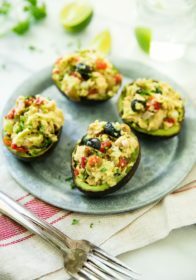 If you give this recipe a try, let me know! Leave a comment and don’t forget to tag a picture #kimscravings on Instagram! I’d love to see your breakfast in action. Enjoy, friends! The perfect warm breakfast for cool crisp mornings! Preheat oven to 350°F. Spray an 8- by 8-inch baking pan with cooking spray. 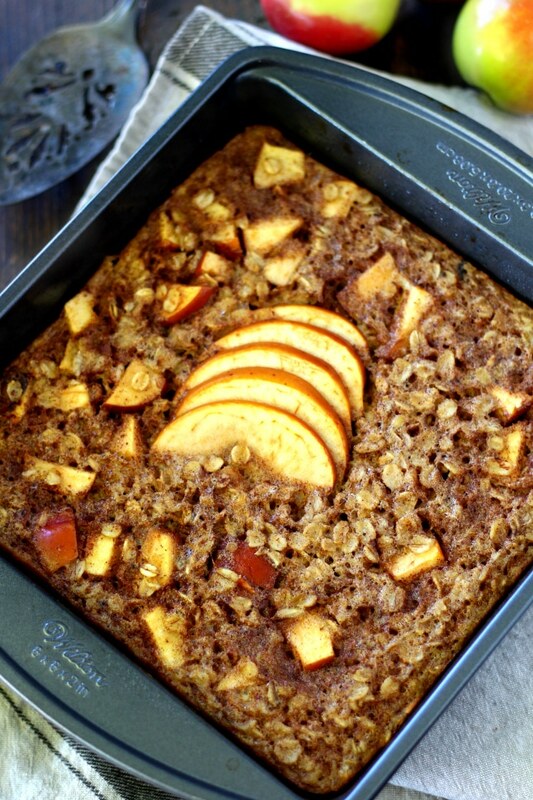 In a large bowl, combine oats, baking powder, salt and diced apple. In a medium bowl, beat eggs and stir in milk, coconut oil, applesauce, brown sugar, cinnamon, nutmeg and allspice. Stir milk mixture into oat mixture until all ingredients are well combined. Pour into prepared baking pan and top with thinly sliced apple. Bake for 25 minutes or until set and light golden brown on top. Allow to cool in the baking dish for at least 5 minutes before slicing. 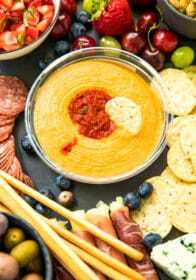 Serve with optional garnishes- enjoy! 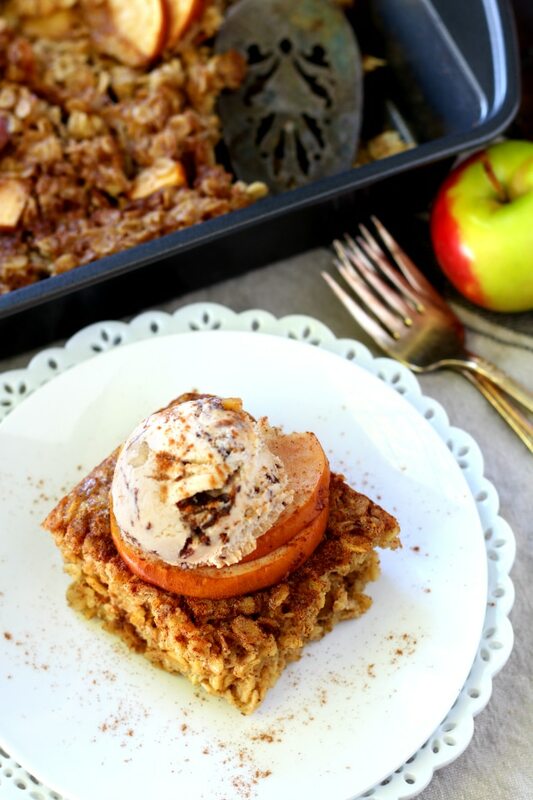 For more apple goodness, try some of my other favorite recipes! 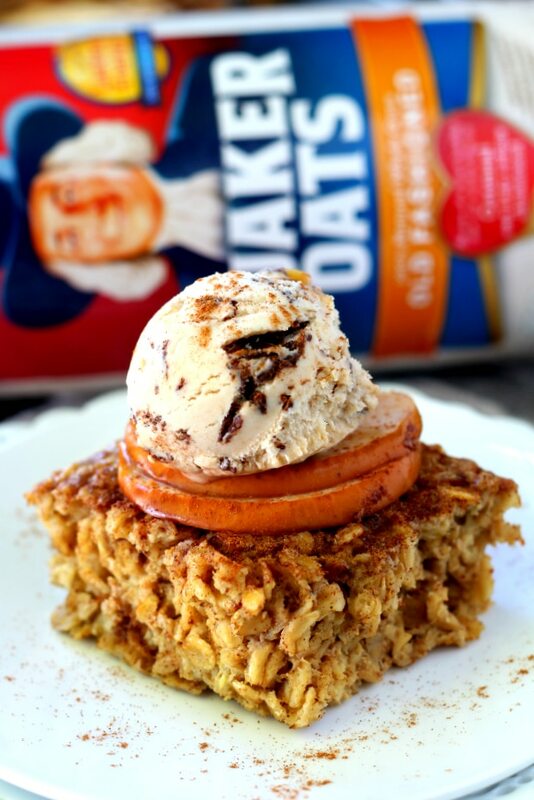 How are you celebrating Oatober? For more information about Quaker Oats, the brand’s latest innovations and recipe ideas, visit QuakerOats.com, Facebook.com/Quaker and follow @Quaker on Twitter, Instagram and Pinterest. I think it’s safe to say that I’ve never heard of baked oatmeal! This one is definitely going into the recipe box! Sounds really good. In checking calories etc. I am surprised that it is 14 g fat. Only two eggs and 1/4 c coconut oil. Is this correct? Yes, I use My Fitness Pal to calculate calories. It feeds 6 and the calories are counted for one serving. Hope you get a chance to give it a try! 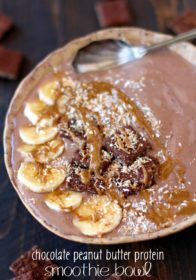 Wow, this looks and sounds like a decadent dessert rather than oatmeal. I can’t believe it’s not all that bad on the waistline either. We went apple picking recently so I’ve got tons to use up! The ice cream on top puts this over the top! Yum! YUM! I bet it’s pretty tasty with a dollop of Greek yogurt, too! But, I’m all about the nut butter. So, maybe a dollop of both? 😀 Om nom nom! 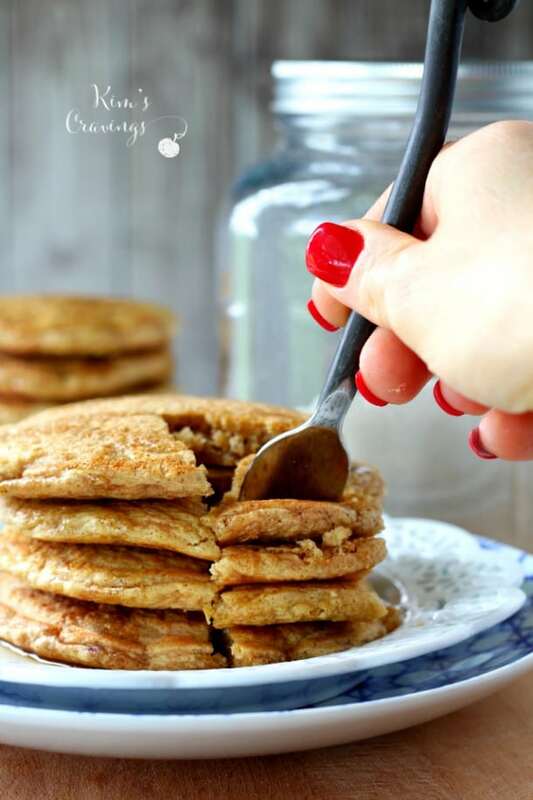 What a delicious breakfast idea for fall! This would be perfect for Thanksgiving morning! I made this and loved it! I have enough for the week! Deliciously different and also made the Banana & Strawberry Oatmeal! Both great! That is so awesome to hear! It’s one of my favorites. 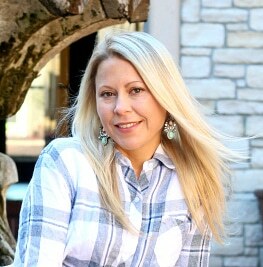 Thanks so much for taking time to comment.